A day full of clean running was not in the forecast on Sunday due to Mother Nature, but the early returns from Circuit de la Sarthe indicate that at least at this point in the run up to the 2015 24 Hours of Le Mans in two weeks from now, the preseason status quo and the early prep race bellwethers shown in both Europe and the U.S. are holding true. 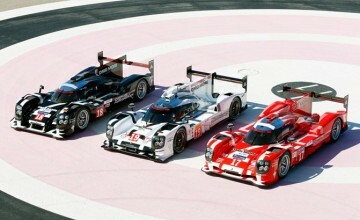 The Porsche Team appears to still be the rabbit of the bunch in the headline LMP-1 division, topping the cumulative time charts with a three minutes, 21.061 second pass from the team’s No. 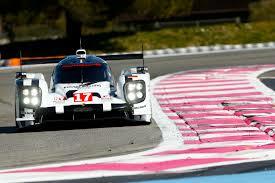 17 Porsche 919 Hybrid. The German rivals from Audi are still well within the ballpark on pace scenarios however. Following a Porsche overall 1-2, the first Audi R18 E-Tron Quattro was next on the chart at 3:22.507, more than a second behind, but not as concerning considering that the time difference is over the course of a 8.45 mile lap, as opposed to Sebring, Silverstone, Spa-Francochamps where that distance would be covered over the course of two or three laps, rather than just one. After claiming the pole position last year at Le Mans, Toyota Motorsports continues to find the pace of their rivals with the TS040 Hybrid. The best of the bunch was only able to post a 3:25.361 personal best, a sign that the focus appears to be on reliability for the Japanese marque this year, after multiple garage visits in the twice around the clock event has thwarted their challenges in recent runnings of the 24 Hours of Le Mans. As for the other Japanese group in the Hybrid club, Sunday was certainly a trial by fire for the Nissan GT-R LMs. The front-engined machine continues to be plagued by a lack of pace and problems with its hybrid systems. The best effort shown by the trio of entrants was a 3:43.383, well off the pace of the other LMP-1s, both hybrid and non-hybrid plus also behind the quickest LMP-2s as well. At this point, it is certainly than was expected from Nissan, considering the major fanfare the manufacturer showed this project by debuting the car via a television commercial shown during the coverage of this year’s NFL Super Bowl in January. Then the issues crept up. An FIA crash test failure and a lack of pace in private testing, forced Nissan to skip the first two rounds of the FIA World Endurance Championship, while the out of the box design strategy also appears to be a work in progress. Even the heads of the project, have conceded that an overall win is unlikely in two weeks, the focus now is simply getting all three cars to the finish. Less dramas were present in LMP-2, as France-based OAK Racing was tops with their Ligier JS P2 with Honda power at 3:41.919, about three tenths of a second clear of the rest of the large field of contenders, led by Signatech Alpine’s Alpine A450b-Nissan. Also close to the pace on Sunday was Murphy Prototypes of Ireland, who were third quick with their Oreca 03R-Nissan open top, followed by the first of the new Oreca 05 coupes belonging to KCMG with Jota Sport rounding out the first five in class with another spyder open top option, the Gibson 015S. The American-based runners in LMP-2 will have their work cut out for them to challenge the front in two weeks time. Krohn Racing maxxed out at 3:47.2 with their Judd-powered Ligier, while Extreme Speed Motorsports were a further seven tenths back with their lead car. After running a pair of Honda cars earlier this season, ESM is running a Ligier-Honda similar to the OAK Racing machine that topped the charts at Le Mans. The team struggled through the Spa-Francochamps FIA WEC round in April with the Ligier, persevering through several garage visits during the six-hour event. In the grand touring divisions, Aston Martin Racing once again showed their impressive pace with their Vantage V8s, leading the Pro category at 3:58.069, just barely ahead of Corvette Racing’s No. 64 C7.R. AMR is looking to turn the tables on Corvette at Le Mans, who have convincingly beat them in the first two major endurance races of 2015, as the Doug Fehan-guided program won the GT class at both Daytona and Sebring. AF Corse Ferrari and Porsche Team Manthey are also within striking distance, posting the third and fourth best times respectively in GTE-Pro. In the Amateur half of GTE, AMR was the only team to post a lap under four minutes, leading the way with a 3:59.338 pass. Among entries currently on the 24 Hours of Le Mans entry list, two AF Corse Ferrari 458s and a third belonging to Russia’s SMP Racing were next on the list. Gulf Racing UK’s Porsche 911 RSR was third on the chart in GTE-Am, however the ELMS regulars currently do not have an entry into the Le Mans field in two weeks time. The team is the third alternate for the race at this time and with none of the 56 entries suffering any difficulties during the test, it appears unlikely that Gulf Racing or the other alternates will be promoted onto the grid in two weeks. The ACO, the sanctioning body for the Le Mans 24 Hours has already announced that the grid for 2016 will be increased to 60 entrants, however despite 64 teams participating at Circuit de la Sarthe on Sunday, including the first two LMP-3 cars to try their luck on the famed layout, they do not plan to expand the grid for this year’s race. 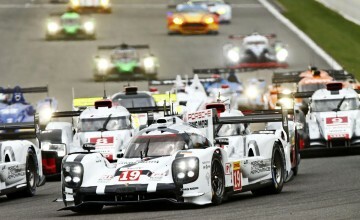 Stay tuned to Rubbings Racing for coverage of the upcoming 24 Hours of Le Mans in two weeks from now.